Check. We process your order when your check clears. Allow an additional 7-10 business days for check clearance. Money Order or Cashiers' Check. We process your order when your payment arrives in the mail. If upon processing your order, the manufacturer tells us it is backordered, we will email you. You may decide to wait for the backordered item to come back into stock, order another item, or cancel your order for an immediate refund. Every manufacturer has different sizing. Your pooch may wear a small in one manufacturer, but may wear a medium in another. Measure your dog's chest prior to ordering to avoid returns! Measure your dog around the chest. Match the measurement on the size chart for the item you want. Go up one size if your dog is at the top of the size range. Do not go by the weight of your dog! Dogs of the same weight have different measurements. 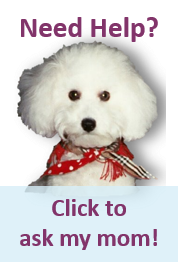 For example, a 12-pound poodle and a 12-pound Bichon have different chest measurements. If you need assistance. Please contact us at 561.495.9971, and we will be happy to help you determine the best size for your pup. Check items for fit immediately upon receipt. You have 15 days after delivery to return an ill-fitting item. We issue an exchange or store credit for a returned item received in resalable condition. *For example, we do not accept for return Halloween costumes after October 31 and Christmas costumes after December 25. If you wish to return a holiday item, you must do so before the holiday and within 15 days after delivery. Call 1-561-495-9971 or email us at info@bowwowsbest.com within 15 days of receipt of your package for a Return Merchandise Authorization Number (RMA), an address for mailing, and approval for an exchange or store credit, good for one year. Place the Return Authorization number on the outside of the package. Ship via an insured carrier (e.g., FedEx, UPS, USPS Parcel Post). Retain your receipt with the tracking number. BowwowsBest.com is not responsible for items delayed, lost, or damaged in transit. Is returned with all the items that came with it. Call 1-561-495-9971 or email us at info@bowwowsbest.com within 24 hours of receipt of your merchandise for directions. Pack items for return or exchange in original packaging, with tags attached, and with anything else that came with the item (i.e., a damaged collar that came with a leash). Shipping charges are not refundable for returns or exchanges for damaged or defective items. If you wish to cancel an order, call us 561-495-9971 within 24 hours of the order. We will issue a refund to your credit card or PayPal. After 24 hours, orders are in process and cannot be cancelled. Instead, when you receive the item, you may follow the directions above for returns. We hold any information that you entrust to BowwowsBest.com strictly in confidence. We do not give or sell any of your personal information to any person or business. We use your personal information only to process your payment and mail your purchase. Prices and policies posted on this site are subject to change without notice. See our Shipping Policies page.